There has been a lot of buzz about Persian rugs with everyone rushing to buy them, and it makes some people wonder what kind of rugs they are. Well, Persian rugs originated from Persia, now called ‘Iran.’ That is why they are also referred to as Iranian carpets. However, with time other regions also started manufacturing this kind of rug and therefore, not all Persian rugs made today are from Iran. These rugs have different characteristics and features depending on their place of manufacture. For example, the rugs from Persia are made up of floral patterns. Those from Turkey are made up of jagged geometric designs, and they are coarser. Here are some interesting facts about Persian rugs or carpets. These rugs have been around for over 2500 years, and this industry continues to boom. Carpet and rug market thrives in Iran and majority of the people who engage in this business are village girls drop-outs who are looking for ways to bring their families more income. Majority of these rugs are hand-woven. Making these rugs takes a long time (several months), but they bring in a lump sum of money once they are finished. 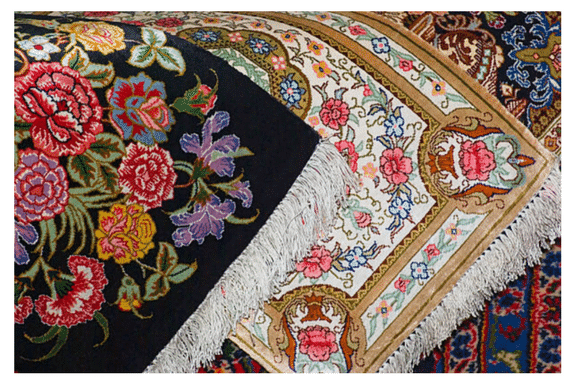 The materials used to make Persian rugs include silk, cotton or wool. Sometimes, the manufacturers combine all of them. The weavers use natural dyes from plants to make these rugs. This fact, coupled with the fact that they are woven by hand is the reason they take longer to be ready. Some even take years to be completed. The areas that are popular for the Persian rugs are the Isfahan region found in central Iran, the Kerman area located in the southeast and East Azerbaijan’s northwestern province. The various regions produce Persian rugs with unique styles. Carpet and rug making are one of the most known things about the Middle East, and people are making literature about it. The topic of these rugs was included in the stories in ‘One Thousand’ which is a publication made up of different tales of South Asia and the Middle East. The Iran Carpet Company, (the company that makes these rugs), made history when it announced that it manufactured the largest hand-woven carpet in the entire world. The carpet measured 5,600 sq meters. Also, the carpet had over 2 billion knots. It was meant for religious purposes. A big mosque found in the United Arab Emirates was the buyer. The manufacturers took two years to weave this carpet and reports showed that it was worth $5.8 million. The Persian rugs have a lot of history and culture. This makes people insanely attracted to them. Also, the design of the rugs, the way they are tied and density that each knot contains are so unique that everyone wants to have them. The Iranian people place so much value on making these rugs. It could be because they form part of their culture and values. They make sure to pass down the skills to the next generation, and they ensure that each generation has a distinct design even though they still use the same method of construction.